The Sikkim Coronation book describes Guru Tashi as the 'first ruler of Sikkim who paved way for a regular monarchy'. Five generations later, it was PhuntsokNamgyal who was consecrated as the first DenjongGyalpo or the king of Sikkim by the three great Lamas who came from the North, West and South to YuksomNorbugang in West Sikkim in 1642 A.D. The event, predicted as it was by Guru Rinpoche, was the 'NaljorChezhi' or the meeting of the four yogic brothers or the four saints or four sages. It was preordained that three saints of great repute from different parts of Tibet make their way to BayulDemajong (Sikkim) to discharge their responsibility of upholding and propogating the essence of Dharma in the hidden land of Demajong. Thus it was that LhatsunNamkhaJigme, KathogKuntuZangpo and GnadakSempaPhuntsokRigzin made their way to Sikkim separately, and through impenetrable routes. This historical congregation of the three holy Lamas is called Yuksom, which in Lepcha means the 'Three Superior Ones'. LhatsunChenpo impressed on the other two that they were all Lamas and needed a layman to rule the kingdom righteously. He further pointed out that, 'In the prophecy of Guru Rinpoche, it is written that four noble brothers shall meet in Demajong and arrange for its government. We were three of those who came from the North, West and South'. As for the East, he quoted the oracular guide book RinchenLingpa which mentioned, 'One of my four avatars will be like a lion, the king among beasts, who will protect the kingdom by his bravery and powers'. The book also mentioned that, 'One named Phuntsok from the direction of Gang will appear'. So LhatsunChenpo deputed a hermit called TogdenKalzangThondup and a layman called Passang to lead a party to Gangtok in invite the person bearing the name of Phuntsog to come to YuksomNorbugang. After several adventures, the party came to Gangtok where they met Phuntsog milking his cows. Phuntsog invited them in and bade them partake of fresh cow's milk and told them his name wasPhuntsog. He saw the invitation of the three Lamas as a most fortuitous event and lost no time in setting out for YuksomNorbugang with his entire retinue of followers, officers and household establishment. The coronation took place in the Chu-ta or water horse year in 1642A.D. Thus PhuntsogNamgyal was installed on the throne of Sikkim with the title of 'Chogyal' or king who rules with righteousness, with both spiritual and temporal powers. 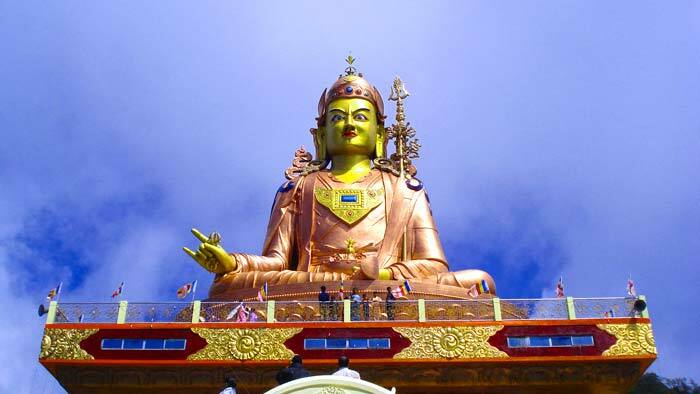 While the three Lamas spread Buddhism in Sikkim, PhuntsogNamgyal started consolidating his kingdom Twelve generations of Chogyals ruled over Sikkim for over 300 years. This tiny Himalayan kingdom however witnessed tumultuous change in 1972-73. In 1975 the institution of the Chogyal was abolished and on May 16th, 1975 Sikkim was formally inducted as the 22nd state of India.